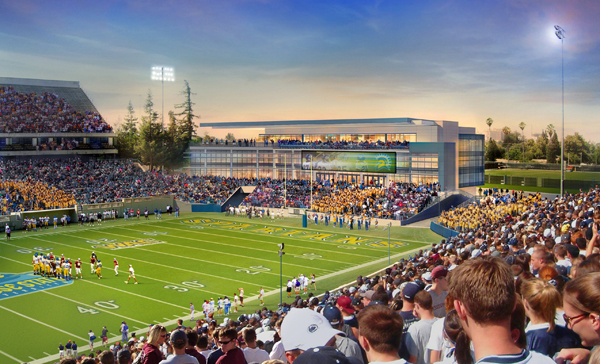 In keeping with its efforts to maintain relevance in the high stakes world of college football, San Jose State University will build Bill Walsh Center, a $9-13 million football training complex on the north end of Spartan Stadium. The Merc’s Jon Wilner has the details. The Bill Walsh Center is expected to house the football program, while the existing Simpkins Center will be repurposed for academic support. The project has been in the works for over a year, while donations have been gathered. The BWC is expected to be completed in time for the 2013 football season. $9-13 million is a drop in the bucket compared to the $321 million Cal spent on Memorial Stadium or even the $100 million John Arrillaga used to rebuild Stanford Stadium. Despite that disparity, it’s enough for San Jose State to continue its program in the WAC, and in light of the outlandish amounts spent at other FBS schools, is a refreshing show of restraint. And in honor of a coach whose genius was largely predicated on dinkin’ and dunkin’ down the field, I suppose the expenditure’s size is appropriate. This entry was posted in College, Football, News. Bookmark the permalink. The BWC is cool, but SJSU needs to really look at improving the whole stadium. I wish they would think bigger. Forget the MWC, look at SDSU going to the Big East. @Larry E – SJSU is gonna have to spend a lot more money if they want to join a BCS conference. It’s probably out of scale with what the program, alumni, and fanbase can support. Are they shrinking the capacity of Spartan Stadium to build the Walsh Center? It looks like the upper half of the end zone grandstand has been eliminated in that rendering. Wow, even in the rendering the upper deck isn’t sold out. Way to aim high, SJSU!